Sonic the Hedgehog 9 is the ninth issue of the Sonic the Hedgehog comic series. It was released in March 1994. 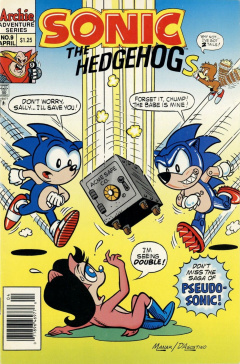 This comic features two stories: Pseudo-Sonic and What's the Point?, along with three featurettes: Tooth or Consequences, Quick Sketch, and Pumped-Up Sonic. Dr. Robotnik is showing, to the reader, all the information he knows about Sonic the Hedgehog on a display. He rolls the display paper up and boasts that he has used it to create the ultimate evil robot: Pseudo Sonic, a mechanized doppelgänger of Sonic. Robotnik looks over a list of powers that his new Sonic double has, one of which states that he requires 3500 AA batteries. Pseudo Sonic suddenly picks up Robotnik and carries him away, crashing through the wall of his factory, boosting Robotnik's memory that the double has the same super speed that the normal Sonic has, and that he can stop on a dime. It takes this command seriously (and literally, at a dime coin) and stops instantly, propelling Robotnik over a cliff from the speed. A dazed Robotnik realizes he still has a few bugs to iron out before he can send Pseudo Sonic out. In the Great Forest, Antoine is standing guard at the secret entrance to Knothole Village when Sonic pops out from the tree trunk door, knocking Antoine aside. Sonic runs off, heading out on a mission to get some flowers for Sally Acorn, knocking Antoine over again from the speed of his take-off. He arrives at a meadow full of flowers and starts picking some, when he is greeted by Betty Butterfly, a small butterfly. She warns him that he's picking flowers from poison blossoms, making him jump in fear. Being extremely allergic to the blossoms, Sonic starts itching his whole body as it starts to swell up. Betty shows Sonic to the readers, who has grown tremendously in size due to the swelling, and doesn't look well at all. Back at the Knothole entrance, it is night, and Antoine is still on guard. He sees Sonic's shadow in the distance and tells him that he is late for curfew. He opens the door and heads down to Knothole, not realizing that Sonic is actually Pseudo Sonic. In Knothole itself, it is late and everybody is getting ready for the night. Bunnie Rabbot shuts down her salon, and Rotor Walrus is keeping track of the time, realizing that Antoine and Sonic are late. Sally hears them coming down the Knothole tube, as Betty Butterfly arrives as well. Antoine arrives, complaining about pushing, only to have the group realize that Sonic isn't who he is, but rather his phony duplicate. As they react in fear, Pseudo Sonic takes out a microphone and prepares to send Robotnik the coordinates of Knothole. Robotnik, watching from a monitor, asks how it found Knothole so easily. Pseudo Sonic states he zig-zagged throughout the forest until he found Antoine and duped him into revealing the entrance. Everybody looks at Antoine in anger as he tries to put blame on the artist for drawing Pseudo Sonic in silhouette. Robotnik, meanwhile, takes out a memo pad and asks for the coordinates. Just as Pseudo Sonic prepares to state them, the signal for the display breaks up and stops. Tails has stopped the transmission, and Pseudo Sonic itself, by running around it, with his tails rubbing the ground, creating static electricity to interfere with its operation. The electricity is too much and Pseudo Sonic blows up. With the remaining pieces left over, Rotor takes them to his shop to analyze them. However, there still remains one problem, the Freedom Fighters don't know where the real Sonic is. Sonic is still in the forest, having used all his power to get out of the poison blossom patch, but he is still swollen, doesn't look well, and extremely itchy. Wanting to get back to Knothole, he tries to enter into a Sonic spin, but falls over due to being weak. In the distance, and coming in fast, Robotnik arrives at the Great Forest, using the initial data he received from Pseudo Sonic, in his eggmobile. He arrives, finding a weak and defenceless Sonic on the ground. Back in Knothole, Rotor analyzes Pseudo Sonic's head, confirming that it was made by Robotnik. Tails wonders what has happened to Sonic, so Betty Butterfly flies over and tells Sally that he got trapped in a poison blossom bush. Sonic, meanwhile, is having a hard time dealing with Robotnik as he uses a flamethrower on the weakened hedgehog. He then brings out a mace from his eggmobile and prepares to hit Sonic. He swoops in for the kill, Sonic too weak to move, only to be stopped by a laser blast that destroys the vehicle. Sonic looks over to see Bunnie Rabbit hop onto the scene, having used a laser in her robotic hand. She takes Robotnik, lifting him up with ease, and jumps with him back to Robotropolis. At the fence to the city, she throws him away into it. Bunnie hops back and expels an ointment from her robotic arm to help Sonic deal with the swelling from the blossoms. Bunnie and Sonic, now all healed, arrive back at the entrance to Knothole, just as Rotor looks up. He takes out the trash and greets Sonic, who asks if he missed any action. As they enter, Rotor tells him that nothing much happens if he isn't around. Sonic thinks that he is, then, hard to replace, just as a disassembled Pseudo Sonic, in the trash can Rotor brought out, asks if he can have a sequel with enough Sonic-grams. Robotnik is playing some mini-putt with golf balls and a cup when Orbinaut arrives, notifying him that his latest robot creation is complete. He runs to the new robot in glee, hoping that it can defeat Sonic and the others once and for all. A Swatbot stands guard, introducing Robotnik to the new bot. Robotnik, however, reacts in shock and asks for the robot to be destroyed immediately. He walks off in a sweat as he realizes he isn't even cruel enough to make this robot: the Dentist 'Bot. In response to letters, Sonic shows how to draw himself, only to have the drawing run off when it's done. Sonic has picked Sally some forget-me-nots as a present, but his speed has caused the flowers' pedals to fly away, leaving a stem. He sits down under a tree, realizing that he has no present for Sally, and a party for her is going on right that moment. In the middle of his thinking, a bird falls on him and onto the ground. Sonic looks at the animal closely and notices that it is a Mobian Needle Bird, half-bird and half-porcupine, a species Sonic thought were roboticized. The animal shows off one of its wings, which is injured. First, Sonic decides to get it some food, thinking of different things it can eat. He runs off to grab some, and returns with some berries. Sonic then remembers that Sally likes animals, so he decides to bring it back for her. Sonic arrives at the party, only to have Sally asking Sonic to get rid of the bird (Thorny). Sonic tries to reason with her, saying it's injured and can't protect itself. Sally reminds Sonic of the other animals they tried to protect, including a beaver who was actually a rotor, a squirrel with a tracking device, and a baby deer that could transform into an aerial bomber. After her speech, Sonic looks around and notice that Thorny has gone missing. The group looks over to see it has eaten Sally's berry cake. Sally looks at Sonic, who has Throny, and yells at him, telling him to get rid of it. Rotor, meanwhile, offers to make a new cake for Sally and plans to pick more berries, but Sally, in her anger, grabs a basket and decides to do it herself. Out in the forest, Sonic places Thorny high up on a tree in a nest, when they both hear a shriek nearby. They look over to see Sally, who has been taken by a living tree while in the middle of picking berries. Back in Robotropolis, Snively notifies Robotnik that one of their forest traps has caught a Freedom Fighter, as they see the sentient tree capturing Sally on a display. Robotnik decides to go to the forest personally to get Sally. Sonic runs over to where he heard Sally's scream, but can't find her in the trees. Just as the sentient tree goes to catch Sonic, he is swooped away by Thorny, who's wings are now fine. Despite what Sally said to Thorny, Sonic convinces it to help him find Sally, as she continues screaming for help. They find her, held by the tree, so Sonic enters into a spindash and cuts through the tree's arm that is holding Sally, dropping her, but Sally still can't get loose from it. Sonic, meanwhile, looks up to see Robotnik with a portable roboticizer. Before he can fire, an egg falls on his head, dropped by Thorny. He wipes off the egg mess, then is hit by a series of porcupine spines by Thorny, causing Robotnik to run away in pain. Sonic helps Sally out, as she thanks Thorny, despite the feelings from earlier. The three walk along together, making Thorny an honorary Freedom Fighter. Pseudo Sonic is based on the same robot designed by Robotnik in the Adventures of Sonic the Hedgehog episode Pseudo Sonic. Rotor Walrus, in his first appearance in this issue, wears a 'My Name is Rotor' tag. The comic, for the first few issues, mistakenly referred to him as Boomer. This issue is brought up again as the group enter Rotor's shop, which originally said 'Boomer's Shop', but has the name 'Rotor' put over it. As revealed in a special in Sonic Archives Vol. III, the issue was originally scripted to feature Evil Sonic instead of Pseudo-Sonic.